With support from the Mukkwaara Family of Sweden through Linder Giffession (volunteer) provided solar lightening system for Taha community clinic, nurse’s quarters andcommunity school to enhance night health delivery at the clinic and pupils learning at night. 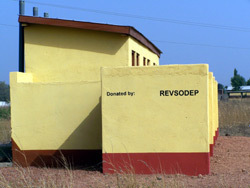 With support from SMAVI of Netherlands provided 10 house hold latrines for Taha and Gbalahi communities in Northern Ghana. 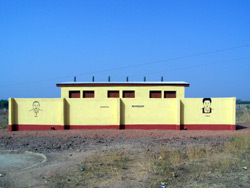 With funds from Irish Aid provided 70 households toilets facilities for Wuvogu, Gbrima, Wuvoguma, Jena, Gbayamni and Katariga. In collaboration with Heritage Seed Company in the Northern Region Provided training for women small holder farmers in green legume seed production in the Tamale and Mion Districts in Ghana. Evaluated some labour saving tools with green legume seed producers in the Tamale and Mion Districts in Ghana. With proceeds from programme fees charged on interns and volunteers we provided 1500 mosquito nets to the communities of Taha, Gbalahi ,Wuvoguma, Gupanarigu Wuvogu and Gbrima, Kumbung Kukuo , Dingoni ,Cheyohi and Zangbaling in Northern Ghana. In collaboration with Volunteer medical students from Lassius University donated assorted quantities of medicated eye glasses to the Tamale Teaching Hospital –Ghana. With our dramatization method reached out to our communities with messages on HIV/AIDS, cancers, Nutrition, six childhoods killer diseases among others with the help of volunteer nurses. Through our dramatization gender impact have been made in our communities with the help of our volunteer. Also received and hosted volunteers from UK, USA, Belgium, Netherlands, Finland, Sweden, and Germany and within Ghana. We recruited and trained 300 community volunteers who support the sustainability of our projects at the community level.